This is a mystery and if anyone can shine more light on it please feel free to comment on this post. Some years ago I had brought to my attention a carbon copy of a sworn affidavit sent anonymously to a friend. It could have been an elaborate forgery but investigation showed that all the people mentioned did exist, and the affidavit certainly had been written and was notated by a solicitor who was still in practice and was contacted. Here is the affidavit with some names withheld. Ms A seems to have done this after what she believed was severe harassment and being forced out of her job. She also knew that Mark James was about to become the local Council Chief Executive. 1. I was employed by Boston Borough Council from 1985 until May 1997 when I was retired on the grounds of ill-health. During my period of employment I was engaged in various posts, but from 1992 until my retirement I was employed in the Personnel Section. 2. During the period August/September 1993 various members of staff were interviewed regarding the restructuring of certain departments. Included in these interviews was Officer A who was employed as Assistant Solicitor to the Council. I was present throughout his interview with Mark James (Director of Administration and Legal Services) and Officer B (Director of Finance). It was clear from the discussion which took place after the interview that Mark James did not want Officer A to continue to be employed by the Council in any capacity. 3. Officer A was made redundant by the Council sometime between September 1993 and May 1994. A subsequently took his case to an Industrial Tribunal, the hearing of which commenced on the 16th May 1994. One of the arguments put forward by Officer A was that the Council had never written to him offering a particular post and with details of the job specification. 4. The day before the hearing of the Industrial Tribunal, Officer C the then Personnel Manager (and my immediate superior officer) told me that Mark James had given instructions that I was to type a letter addressed to Officer A offering him a particular post with the Council, and enclosing with it a job description. I was told that the instructions from Mark James were that the letter was to be back-dated to a date in September 1993. I told Officer C that what I was being asked to do was wrong and I was not prepared to comply with Mr James' instructions. I was informed that if I did not comply with such instructions it was very likely that I would be dismissed. As I was in fear of losing my job I carried out the instruction, but to safeguard myself I typed on the disc containing the letter words to the effect that "this letter was actually typed on the .....". I was told to file a copy of the letter on the appropriate file in date order but that the original was to be destroyed. 5. I am informed that at Officer A's Industrial Tribunal, Mr James gave evidence on oath that the letter in question had been typed and sent to Officer A in September 1993. This was not possible as Mr James knew full well that I did not type the letter until May 1994. 6. I have to say that when passing on the instructions from Mr James, Officer C was also very concerned that what I had been told to do was not correct, and as a result of him refusing to carry out tasks of a similar nature thereafter Officer C was squeezed out of his post on payment of compensation. a) Instructed a member of staff to carry out an act which he knew as unlawful in its intent. c) Deliberately lied under oath at an Industrial Tribunal by saying that a letter had been sent to Officer A in September 1993 knowing that such a letter had not been typed until May 1994. 8. In November 1994 a Personnel Assistant (Officer D) was appointed. From the very beginning she harassed me in various ways, and on many occasions this harassment was of a sexual nature. This harassment seriously affected my health, and by October 1996 I had had enough. I accordingly saw Mark James and reported to him some six or seven complaints of a serious nature against both Officer D and my departmental head, Officer E. Mr James did not want to know, and merely told me to repeat my allegations to Officer E (one of the perpetrators) for him to deal with. I could not believe that as the Director of the Council fully responsible for staff matters and the Monitoring Officer, and in view of the seriousness of the allegations, he did not commence an immediate investigation. 9. Two days after my interview with Mark James I had to see my doctor because of the stressful affect the actions described were having on my health. My doctor issued a certificate, and I did not return to work after that date. 10. There are both current and former members of staff who can verify that the facts I have stated above are correct. Officer C has confirmed to me that he is prepared to attend any inquiry to confirm the facts regarding the typing of the backdated letter. If I am given access to the discs in the Personnel Department I can easily identify the one containing the letter and my note thereon. This is providing the disc has not been destroyed. Sworn before a Commissioner for Oaths, and signed by both. This confirms the allegations but inconveniently there is no record of any conclusions. I have also been able to contact Officer C, who strongly confirms the integrity of Ms A. 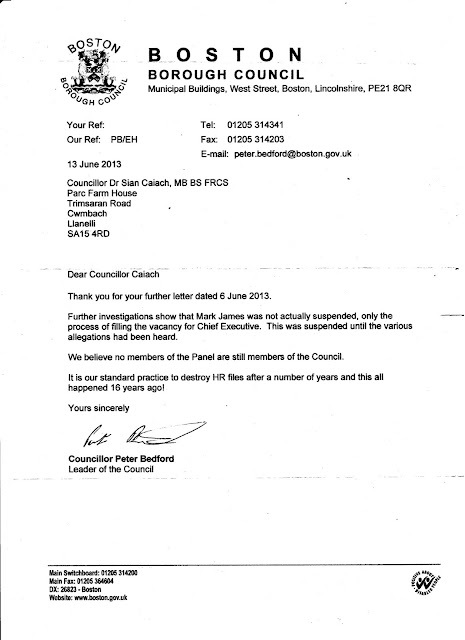 A subsequent freedom of information to the Council request also failed to produce any record of what had happened. This is a mystery in that all that can be confirmed from the information I have is that these allegations were made and there is no evidence that it was .ever refuted. The complainant may have been genuine but unfortunately all records have been destroyed. When contacted Ms A confirmed her identity as per the affidavit but said she was unable to discuss the details of what had happened. However, this does mirror several cases that have happened closer to home. There have been several Carmarthenshire County Council staff whistle blowers, and some county residents who somehow have just got on the wrong side of Council Officers for various reasons who appear to have been appallingly treated just to try to silence them and/or to hide mistakes or misconduct. In her recent blog, http://carmarthenplanning.blogspot.co.uk , Jacqui Thompson recalls that Mr James included in a police complaint against her that she had accused him of tampering with documents before an industrial tribunal. It refered to this case. Actually, it was Ms A who made the accusation. and in her affidavit she admits not to tampering, but to forging , under duress, a completely new false document in order to make it look like officer B, who was dismissed was lying. There were also the allegations of harassment of her, some of it of a sexual nature, and she claims Mr James asked her to refer the matter back to the one of the people she claimed was harassing her. However,.this sort of senior managerial behaviour certainly does exist and produces an atmosphere of fear.Although this encourages compliance , it also encourages overlooking bad conduct and poor practice as criticism is dangerous. Anything which suggests a problem is not welcome news. Huge efforts are made to hide failures.These organisations often seem to slowly rot outwards from the core, but their senior employees are rarely brought to book when catalogue of failures finally nudges them gracefully into standing down, usually with a good pension and subsequently a place on a prestigious committee or a job as a senior adviser. The people who get in the way rarely prosper after their encounters. Surely, it is time for change, and a good look at how the public sector is run? Interestingly my complaints against Mr James and Linda Rees Jones have been passed to HR. Seems a good way to bury complaints. However I was told categorically,by staff in the HR dept, that HR do not deal with complaints from members of the public. My question is why my complaint has been given to Mark James deputy? ANd if you complained that your 13 year old daughter was propositioned by a council workman cutting the grass verge, do they seriously maintain HR would stay out of it? carmarthenshire is in free fall. Death throes it appears.